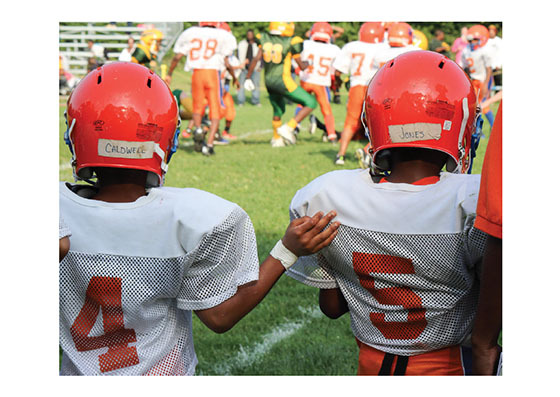 The Wilson Art Gallery will host “The Thornden Park Bulldogs”, an exhibit of photographs by Irene Liu, Associate Professor of Philosophy at Le Moyne College, documenting a local youth football team over two seasons as it pursues wins and cultivates the virtues of sportsmanship. Irene Liu earned her PhD from the University of Chicago and her areas of research are ethics, human nature, and the history of philosophy. Before pursuing her doctorate degree, Liu worked as an art educator at the Whitney Museum of American Art and the Boys' Club of New York. She originally intended this project to explore the cultivation of sportsmanship and the community of family and friends that forms around it, but in the aftermath of Ferguson and #BlackLivesMatter, the photographs have the added goal to make black boys visible — smiling, playing, focusing, growing, and working together in the pursuit of excellence. On Friday, February 26, from 4 to 6 p.m., there will be an opening reception for the exhibit, which will be on display at the Wilson Art Gallery from February 26 – March 25 during regular library hours. The reception and exhibit are free and open to the public. For more information, call (315) 445-4153.